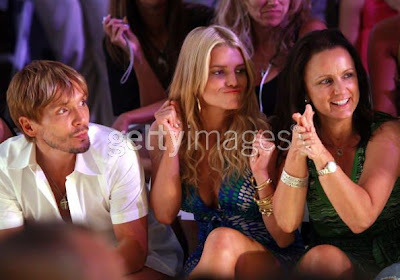 I’ve never been to a fashion show before (luckily), but what takes place at these events that would ever bring on such a variety of facial expressions from Jessica Simpson? Jessica got a front row seat at her own fashion show for swimwear at the “Mercedes Benz Fashion Week – Miami Swim.” Ok, so a couple questions. (1) Now is Jessica’s mother, Tina, 17 years old? (2) Is Tina making her fingers into a fake gun in the last photo? Perhaps she’ll use it on herself? (3) Is Tina Simpson and Lynne Spears (Britney’s mom) the same exact person? I think they are. Ok, so all 3 questions were about Tina Simpson, but she’s becoming the new Dina Lohan for me. Anyway, I’m happy that Jessica is hot again. Now if only we could turn her into some type of drunk. Here’s to hoping.